Central California is the breadbasket of the United States. Many of our students come from farming or farm-worker families. The first grade team at Summit Charter Academy Lombardi in Porterville, California used a hands-on approach with the transdisciplinary theme Who we are. Students were front-loaded with experiences in comparing and contrasting similarities and differences between themselves and others in class before they were introduced to the concept of comparing similarities and differences in cultures around the world. 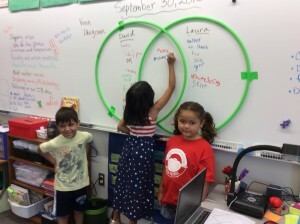 The unit launch was undertaken with the book entitled I’m Like You, You’re Like Me by Cindy Gainer, a class activity with hula hoops taped to the board to represent a Venn diagram (see photo below), and also with Venn Diagram and Double Bubble Thinking Map activities which required students to collaborate as they honed their skills at comparing and contrasting (see photos below). First graders explore the theme ‘Who we are’ and learn to compare and contrast cultures from around the world. For the next step with our central idea of “Similarities and differences influence connections through communities and cultures,” teachers modeled several inquiries so that the students had a framework for their summative assessment where they were asked to choose a culture to research. They were also asked compare and contrast with another culture. Students were excited to research another culture that they were asking to work on their summative half-way through the theme unit! Teacher-modeled inquiries included how customs and traditions in students’ own cultural backgrounds are the same or different from Native American cultures (for example Hopi Pueblo) and also explored the similarities and differences between Native American cultures and cultures from Honduras, Mexico, and the Philippines. These cultures were selected because they are represented by students in our first grade classes. For approaches to learning, students collaborated using technology to research information. They also collaborated with classmates and 6th grade technology buddies to research and produce graphic organizers about the Hopi and Inuit Native American culture, and cultures in Honduras, Mexico and the Philippines using iPad apps including Popplet and Book Creator. Each culture prompted an inquiry across content areas of science, reading, writing, mathematics, art and music featuring experiences with food, language, and traditions. Content area activities included writing informational articles, reading as research was undertaken, science explorations with sound and vibrations and the making of a drum project at home, making a rainstick project with a paper towel tube (students discovered that both projects reached across cultures), art projects recreating Kachina dolls from the Hopi culture, dreamcatchers, parol stars from the Philippine culture, and Day of the Dead activities and projects such as tissue paper flowers and banners from Mexico. Teachers were able to gather realia (a real Parol from the Philippines, real rain sticks from Chile, Africa, and Honduras) to enhance the hands-on approach to learning. Action was taken as students asked their parents to volunteer to come to class to explain about their own cultural background. These special guests included families from the Inuit culture in Alaska USA, Honduras, Mexico, Hopi culture in Arizona, USA, and the Philippines. As we reflected on this unity of inquiry, we were impressed by how eager our students were to learn about cultures outside of our community. Some of them brought stories to share about family backgrounds, relatives who were living in other countries, or just expressed a general interest in another culture. 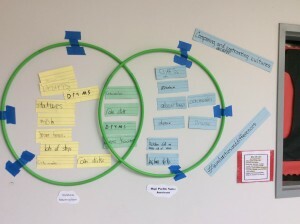 Students began to internalize the process of comparing and contrasting, and even connected this process to other content areas such as mathematics (Student: “I see that this strategy for addition is the same as that one because….”). Next year we plan to enhance our unit with more realia and more fiction and non-fiction books, and cross more content areas. Who are we in Central California? We are part of the global IB community eager to facilitate an environment of inquiry for our students as they connect with local and global cultures. Barbara Gaffrey for the First Grade Team of Randa Ward, Erin Poe, and Odilia Rodriguez at Summit Charter Academy, Lombardi – an IB World School in Porterville, California, USA. 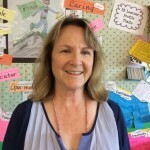 Barbara Gaffrey is a first grade teacher at the Summit Charter Academy, Lombardi Kindergarten-6th grade in the Burton School District in Porterville, California, USA. 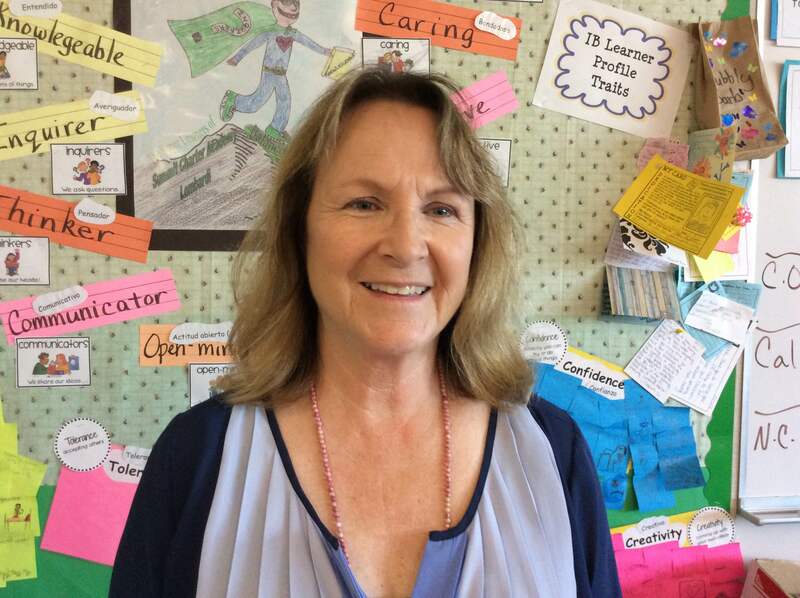 She has been teaching first and second grade for 31 years, the last four years in the newly authorized Lombardi IB World School. Barbara has been trained in Reading Recovery and is beginning to appreciate the enormous value of technology in student inquiry. Wow this is an awesome unit! I am going to share it with all of my colleagues now. I really like the hoops and the class visitors! Thank you for your response, Brian Lalor. We are excited that the IB world community finds our ideas useful! This was very helpful, thanks. I love the hula hoops too! I am from California but now teaching in Cambodia, and am currently teaching the Who We Are unit. Thanks for the ideas. We are happy to share ideas. Thanks for your response Jerry. This tool is versatile in any content area. So glad you are interested to try it! wow this is really amazing, really love the hoop…. Great job! Thank you! I hope you find some useful ideas. We(our third graders) just recently sent some postcards to a school in Denmark, (shared great chinese persons in history)and after reading this blog I feel so inspired by your class, and motivated that my ideas are relevant to PYP. Thank you! I’m glad to hear that you connect with our ideas.